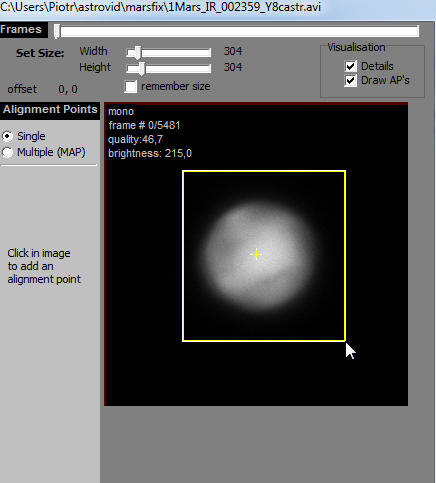 Autostakkert 2 is a new version of a popular planetary stacking program. The new version brings a lot of improvements as well as new features like support for surface stacking - Lunar and Solar AVIs. The app is free and you can download it from the application site. For planetary AVIs you will also need Castrator that aligns and centers every planetary frame on the AVI. Just open you recording, select cropped side and start the process. Cropped and aligned Castrator avis may then be used in Autostakkert2. For Lunar and Solar images it's not needed. 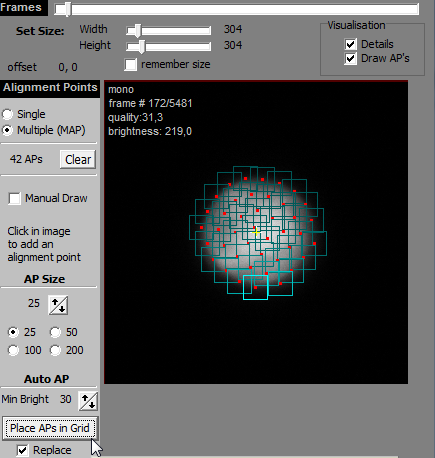 In Autostakkert 2 you open your AVI files, tune the application settings, select the alignment area and you start stacking. Multiple planetary AVIs may be stacked in one run. For surface AVIs you need to configure and stack one AVI at a time (no batch support). When you launch AS2 you will get two windows. One for setting, and on the right side smaller one for preview and alignment area configuration. Quality Estimator: choose an algorithm for quality measurements. The "Gradient" is the default one and works nicely. "Noise Robust" may improve it performance. For very good AVIs (super seeing) user low numbers, for very bad - bigger. In AS2 stacks are made from given amount of frames starting from the best ones. If you stack to much the quality of the stack may be lower as bad frames would be added to the stack. There is no one always-good value for those stacks. You may start with 25% and 50% (75%) stacks and compare them. 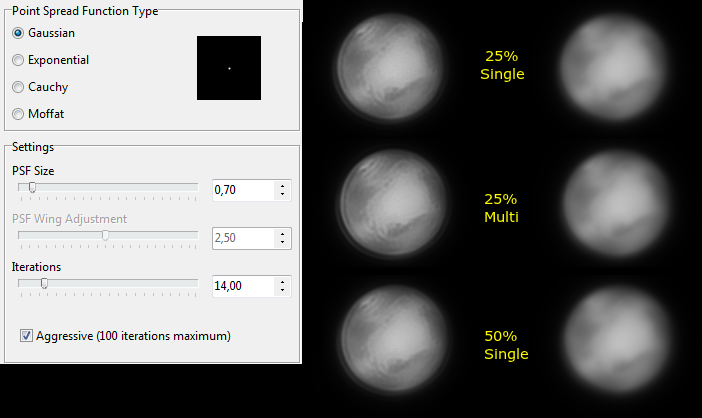 For stacking settings optimization you may try with only few % of frames - the stacks will be noisy, but if the alignment settings are good then the image should be sharp. Drizzle: upsizing stacks by Drizzle - either 1.5x or 3x. When you open some AVIs you will get a preview in the right window. You may select either single or multiple alignment areas on the planet or Sun/Moon surface. For single area just select it with a mouse. When you do that you may start stacking by clicking the "Stack" button in the main window.